This is part 4 of our Food and Travel series 2015 featuring the places we visited during our tour of Europe in August. We are featuring two cities here – Munich and Berlin. There is so much to show and learn about these fascinating cities and our quick tour is not enough to cover them all. This is simply a quick overview of what can be seen there. Nonetheless, I hope you enjoy browsing through. This photo was taken at Marienplatz – a central square in the center of Munich. It has been the city’s main square since 1158 and this was the place where we began our tour. Even before hubby made the itinerary for our Europe 2015 trip, I have been watching documentaries about World War II so when I learned we were passing by Munich en route to Vienna, I knew I wanted to do a tour that would touch on this. We only had a brief time in Munich so we decided to do the Third Reich Tour – a very popular tour in Munich. This was our first stop. We were shown a stone plaque which served as a memorial for the “Kristallnacht” or “Night of the Broken Glass.” It was quite sobering and sad to read this and see the place where the incitement to Jewish persecution actually began. The plaque was inside the south entrance (left side of the photo but not visible) of the Old Town Hall (Altes Rathaus) – quite a grand building with gothic-style spiked towers. For some reason, I didn’t quite get a good photo of it – perhaps because I was behind the tour group already and rushing behind them. Anyway, here’s a photo of the Old Town Hall from Wikipedia (photo credit goes to Pedelecs). Inside the Hofbrauhaus – the famous Beer Hall in Munich. Hitler delivered speeches and held meetings here during the Nazi occupation of Munich. Just outside Hofbrauhaus. 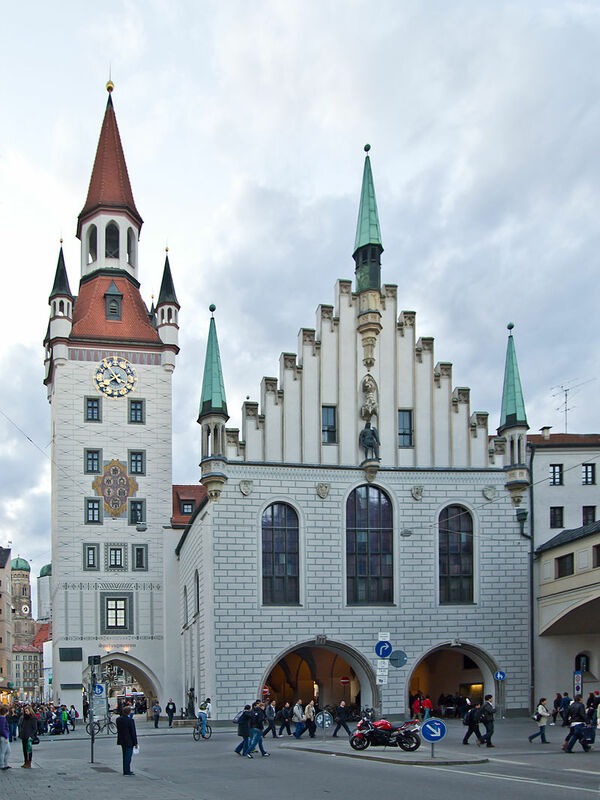 Munich is a pedestrian paradise – it’s the perfect walking city and is truly magnificent. For lack of a better description, to me it looks like a beautiful Hollywood set – it’s so pretty. Our tour was naturally sober as it pertained to the darker past of the city so it was good to see the city at present in contrast bustling with life and festivities. As we went around the other historical points of the tour, we got some time to take a break and have a quick photo shoot. The old town of Munich was full of tourists despite the heat (the photo doesn’t show it, of course) with the temperature in the upper 30s in celsius (90s in fahrenheit). The tour took us to different parts of the town and I was happy to click my camera here and there. I was getting behind now as even my kids were ahead of me so I thought, I better stop taking photos so I could catch up. Our next stop was in a small street paved with bronze called – Druckebergergassi or “Shirker’s/Dodger’s Lane.” Why this street came to be known as such is explained below. I had to have my photo here as this was quite moving to me as it showed that it their own way the citizens of Munich showed that not all of them were in agreement with Hitler and this little path was proof of the silent protest to what was happening then. The Feldherrnhalle (Field Marshall’s Hall) – originally meant to be a monument to the Bavarian army but when the Nazis came to power it became a site of a memorial for the 16 Nazis who died in the foiled Beer Hall Putsch. Guards were placed in the area and any one passing through where the memorial tablet was located had to honor it with a Hitler salute. The people of Munich who didn’t want to do this took another route to avoid the site. This was the street called Shirker’s Lane (just behind this square) now paved with bronze as a remembrance to those who risked their lives disobeying Hitler’s rules. The Nazi tablet was removed after WWII and in 1994 a new plaque was added honoring the lives of the 4 policemen who died during the putsch. This is the street that leads you to the Odeonplatz where the Feldherrnhalle is located. Presently, the square and the hall is a much happier place where concerts and art installations are often held. Just a little farther on is the Platz der Opfer des Nationalsozialismus (Square of the Victims of National Socialism (or Nazi). In the center of the square is memorial – an eternal flame – a monument to the victims of Nazism. Sophie with our tour guide. Our final stop was in Königsplatz a square which was used as the place for Nazi mass rallies during the Third Reich. The building in the photo is the Fuhrerbau located near the square which housed Hitler’s office in Munich. Hitler and Neville Chamberlain signed the Munich agreement here in 1938. While much of the city had been leveled off by the Allied bombings, this building was only slightly damaged and still exists today and has been converted to a school of music and theater. At the end of our tour we went back to Marienplatz where we started. Here are a few shots of Marienplatz. The photo is of the Neues Rathaus (New City Hall) with the famous glockenspiel that chimes daily. Look at all that detail in the design. I love examining the little details in old buildings as I find them to be fascinating. I am glad I didn’t miss this dragon – easy to miss when you don’t look hard. The dragon represented famine – just one of the four adversities the city faced as depicted on the building. It was a 3-hour long walking tour so you can imagine we were famished afterwards. We found this beautiful restaurant which had an outside seating surrounded by magnificent buildings. We had to queue in order to get a place but the manager told us if we didn’t want to wait there’s immediate seating for us inside where, he proudly announced: “There’s aircon!” The mention of airconditioning finally convinced us to forget about the outside seating – after all it was miserably hot outside – and we wanted to enjoy dinner while relaxing and not sweating. Besides, when we went in we saw how grand it was inside anyway. It was like eating in a cathedral – look at that ceiling. Sorry, my picture doesn’t do justice to the place really. Of course, you can’t go to Germany and not eat the food they are famous for – sausages. So, I ordered a sampler – 5 varieties of the best sausages they had on offer. Hubby and I shared and we were both happy with our choice! After Munich, we took another train to Vienna, Austria where we met up with Mark’s family. We visited a local baptist church in the area. This was our main destination for the entire trip so we spent more days here. Thereafter, we took the train to Prague, stayed there for 2 nights and on the third day we headed for Berlin. It was nearly dinner time when we arrived in Berlin. We didn’t know where to look for food but thankfully in our quick stroll we found a small restaurant not far from our hotel selling Currywurst – a specialty in Berlin. It is essentially a German sausage, often cut into slices and served drizzled with curry-flavored sauce and dusted some more with curry powder. It is usually paired with some fries on the side and, if you fancy, a German beer. We really loved it. Truth is most of the food we ate while on this trip was currywurst and schnitzels! And, since we arrived in the US, we’ve already made our own version of curry-wurst and you may even see this on the blog soon! Anyway, here’s a photo of us in the restaurant – all of us looking full after eating all that sausages. We went strolling around the area for our first night and this is a typical scenery. The next day the sun shone gloriously bright again. We went to Alexanderplatz, the central square in the heart of Berlin which is very popular with the crowd. Near the square you can find Berlin’s symbol – the Berlin TV Tower. It is certainly a hang-out area especially as you can listen to some entertainment while there. You will never miss what time it is anywhere in the world as the big Weltzeituhr (Worldtime Clock) is also located in Alexanderplatz. In the afternoon we joined a walking tour of Berlin. This time we decided not to do another Third Reich Tour as we wanted to learn more about the city’s history besides the Nazi occupation. We were certain it would be touched upon anyway as Berlin was the capital of the Nazis when they ruled Germany. The meeting place was at a Starbucks near Brandenburg Gate, an 18th-century triumphal arc in Berlin. It is a very well-known landmark in Germany. Here’s our very knowledgeable (and funny, too!) English tour guide – Sam Noble. If you are ever in Berlin, get a tour with him. There goes my free plug. The first building he pointed to us located just across Brandenburg Gate is the most expensive hotel in Berlin – the Hotel Adlon. President Barack Obama, Queen Elizabeth II other prominent individuals and Hollywood celebrities have stayed in this hotel. Does it look somewhat familiar to you? If it is, it’s because this hotel became even more famous as the place where Michael Jackson dangled his baby by the balcony of his suite. Perhaps it was one of the the balconies above??? The memories of that photo suddenly comes to mind. And then we moved on….passing by the British Embassy as you can see. It was quite a big group – I’d say about 40 people and mostly young people, too. We stopped at the Memorial to the Murdered Jews of Europe (Holocaust Memorial). It has an underground information center where you can find the list of names of all known Holocaust victims. We stood here for a few minutes in silence. It’s hard to even imagine how it all happened and yet it did. Thereafter, he gave us a brief history of the country. It was fascinating. I wish I had read more about Germany’s history before I came. Fast forward to 1945. This was the site of Hitler’s Bunker in Berlin – the place where he ended his life as the Allied forces where closing in. It felt strange and hard to imagine that this nondescript location is where everything finally ended. The bunker is located underneath a car park surrounded by apartment buildings exactly where we were standing. The construction of the buildings in the area around the Fuhrerbunker was a plan to ensure that the surroundings remain anonymous and unremarkable. The government authorities wanted to destroy any trace of the Nazi remains lest anyone make a shrine or something here. That would have been unthinkable. I think Sam was showing us a photo of what it looked like here. This is one of the Nazi buildings that survived the bombings in World War II. It housed the Ministry of Avition during the Nazi Era. Our tour guide said everyone hates this building – then because of what the Nazi used it for but even today as it now houses the Tax office. I just had to take a photo of this. This welcomes you as you approach the Berlin Wall so you can’t miss it! Sam giving us a brief history of the Communist era in East Germany. Behind is a portion of the Berlin Wall. Quick pose by the Berlin Wall. Our tour guide said that it’s ironic that the Berlin Wall is now being protected by another wall (barbed fence). Well, he blames the tourists who have been chipping off bits and pieces of the wall as you can see in the hole so they had to protect it with a wired fence. Don’t worry I didn’t chip off any piece, we just bought a little piece as souvenir. We asked him if the bits of the wall being sold are genuine and he said, “Yes, they are.” He said it’s a very long wall about 41 kilometers in length and only about 2 kilometers worth (the colorful portions of it) were brought down and sold at auction or something like that. I can’t remember the details. Anyway, the bits and pieces of the painted portion of the wall, as it’s more colorful, are the ones that they sell in souvenir shops. where it was – to please them they built this area and you can even pose photos with the guards there provided you pay a fee. I don’t have a problem with this really. Anyway, the crossing may not be real anymore but the photo you see is a true one of an American soldier stationed here before. On the other side you would see a photo of an East German soldier though he said that one is not real. Once you get to the Gendarmenmarkt, another popular square in the city, you will think you are seeing doubles. And literally you are seeing double – on the opposite side of the squares are two identical looking churches. The one above is the Neue Kirche (New Church) or more popularly known as the German church. Below is the Französischer Dom (French Cathedral/Church). Our tour guide jokingly said, “Well, if they had to build a church for the French then they had to build another one for the Germans.” I don’t understand why they had to look exactly the same. 🙂 I need to research on this. I am such a geek! We stopped by Humboldt University, one of the oldest universities in Berlin. Some notables who had connections with the university are Otto Van Bismarck, Karl Marx and Albert Einstein. Did you see the movie the Book Thief? This was the spot where the book burning took place. When you look below all you see are stack of empty bookshelves. This was just right across the university’s building. This is how you tour Berlin in style. This is where we ended our tour. It was a great one and one I highly recommend if you ever go to Berlin. He did not fail to mention that although you cannot deny the dark history of the city or perhaps the county as a whole, the people have dealt with and continue to deal with the past and not try to bury or forget it. We wanted to go back to Alexanderplatz to catch the train back to our hotel, Thankfully, we spotted the tower so we knew we were in the right place and not too far. This magnificent building is the Berlin Dom (Berlin Cathedral). Behind the cathedral is the Spree River and you see many cruises that pass through it. Just a little selfie by the river with the facade of the Cathedral in the background. It was our last night in Berlin and as you can guess, we had sausages again. I think this was a Bavarian sausage with boiled potatoes and sauerkraut. Hubby as expected had his last currywurst!!! Back to our hotel – no I am not advertising Prada – the hotel just happened to be just beside it. Kind of weird but there it is. Well, we certainly had a lovely time in Germany. There was so much to see but as always, so little time. Hope you enjoyed this little glimpse into Munich and Berlin. I love all of your pictures. I've never been to Germany, but studied the language and the culture for six years. I'd love to go someday! You would love it there Monique especially since you know the language and culture – that's awesome! I love Germany, and it's a good thing I love sausages. Thank you for sharing your amazing trip with us, you look like you had a lovely time. We ate far too many sausages and schnitzels I think….lol. Thanks, Janette! We really had a lovely time! You must be exhausted. So much to see and looks like you saw it all. Sausages abound in Germany. Good that you got a sample of many. So you could tell us about them! YUM. We were exhausted for sure but it was worth it, KC. We barely scratched the surface as there was still a lot to see but perhaps we can go back for another visit. 🙂 Thanks for stopping by. Been to Berlin and loved it and really want to go back. You seem to have had a fab time. Would love to go back to Berlin too Bintu – we really had a lovely time, thanks! What an incredible trip you and your beautiful family experienced Abby! So much beauty and the building architectures are amazing. I'm especially touched that you took the time to take the Third Reich tour as it's so critical that we educate our children about the atrocities suffered during the Nazi regime. I am passing on your post to my family and friends who I know will be very interested in your descriptions and photos of the sites you visited. Thank you Abby…I am certain your post will touch many. Wishing your kids a fantastic school year! Awwww. Thank you for your very kind and sweet comments, Linda. I honestly think that a trip to Munich or Berlin would not be complete without a Third Reich tour. What happened in these places cannot be denied and it's part of history that everyone should know and learn from. Hope your family enjoys the post. Thanks. What a wonderful tour! The US is such a young country–it is amazing to see photos of places that have been in existence for hundreds of years. And all the sausages! You have such a beautiful family! What an amazing trip!!! Oh Abigail! I thoroughly enjoyed my virtual walk through Munich with you! My mom and brother have both been to Germany, Poland and Chechloslovakia (our ancestors are from there. Thats what is was called when I was a kid.) They have seen the death camps,… and cried. Thank you for reminding us that the Germans keep the monuments up and the tours of the horrible history going so no one forgets what was done. We must never forget! Lol. Love those sausages! Can't wait for that curry post! Hi Diane! I am glad you enjoyed the post. We got to visit Prague (sometimes I still used Czechoslovakia, too when we were there out of habit) and it was so beautiful there – the highlight of our trip. I think these tours will continue as there are many people who are interested to learn about it and that's good so no one forgets as you said. I've been to Munich but not to Berlin! I loved the city! You had such a lovely time and so many beautiful memories! The Germans sure do like their sausages! I am hoping to go to Munich this year for the Christmas market. I would love to take a foodie tour of Germany some time! It seems like such an adventure! So beautiful. A trip to fill all the senses! I love your travel photos and have been over here more than once, all looks divine. A magical trip! Looks like a fabulous time (and food)! What a wonderful trip! We hope to travel to Germany soon!